Windows 7 is the most popular and the most used Windows ever. It is crafted for speed and the best user experience. But like every edition of Windows this too slows down with time. This is not the problem with the OS, but with the unwanted files and services that starts to accumulate. So to Speed Up Windows 7, here is our detailed guide. Just follow each step carefully and you will have a faster Windows 7. Windows 7 comes with many visual tweaks which provides it an amazing look and feel. But this comes against a cost, cost of performance. 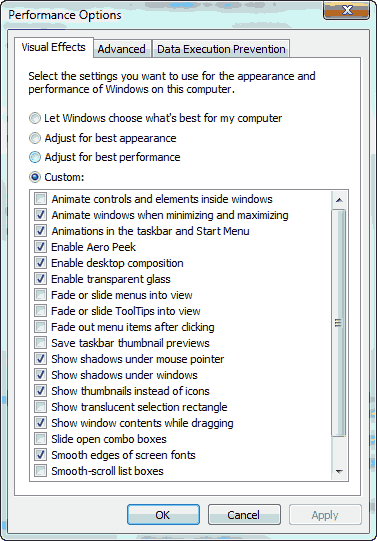 But we can disable these effects individually to speed up Windows 7. 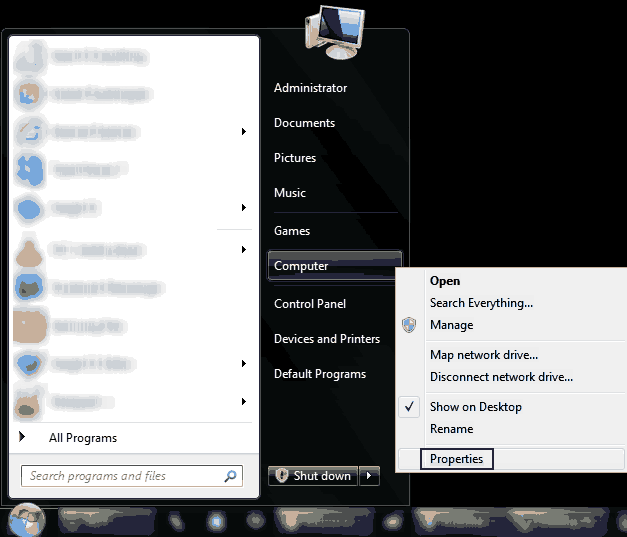 Open Start Menu, right-click on Computer and select Properties. 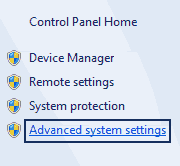 Now in the window that opens, select Advanced System Settings in the top left. Go to Advanced tab and select Settings under Performance menu. Under Visual Effects tab you have four options. Either you can get the best Visual Appearance with degraded performance, or get the best performance with an ugly-looking operating system or you can let Window’s choose the best configuration for you or you can play with the individual options and decide yourself. 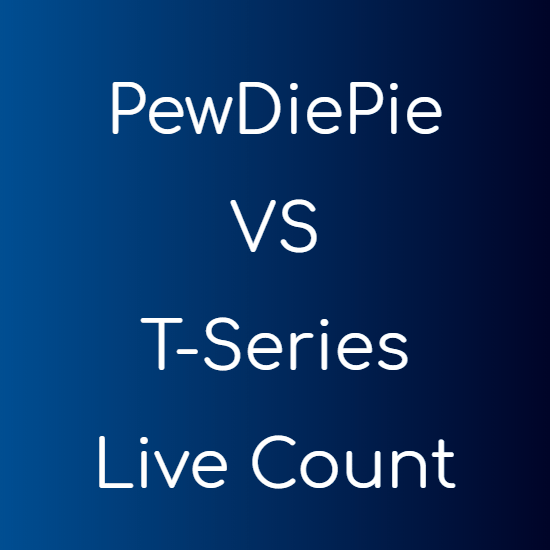 TIPIf you are on an older computer or a computer with a basic configuration then I would recommend you to select Adjust for Best Performance option. The look will be a little less attractive but it will Speed Up Windows 7 for sure. Most of the programs today register themselves to start up at every boot. This is done to speed up the loading of program when you run it. But these load every time you start your computer and add to the boot time. So to speed up your PC you can disable the ones you use less often. Open Start Menu and type msconfig and hit Enter. 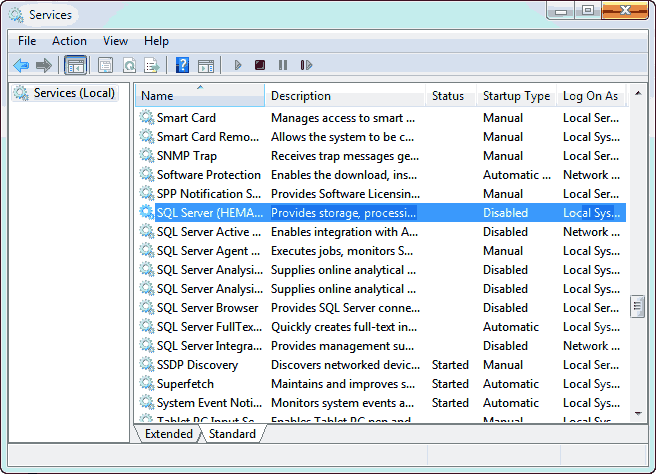 In the System Configuration window that pops up, go to the Startup tab. Now uncheck all the startup processes that you don’t want to be loaded at startup, or precisely the ones you don’t use often. TIP The more applications you disable here, the less will be the boot up time. Windows stores many temporary files when you install any program or install windows updates. It also stores the backups of update packages, backups of service pack, offline web pages, thumbnail cache, etc. But over the time they become obsolete and are no longer required by the system and thus should be removed. 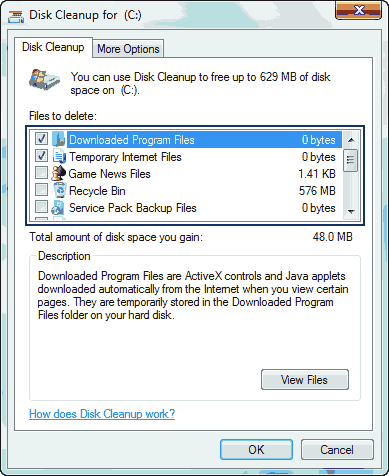 Windows gives you a simple solution to delete these unwanted files. 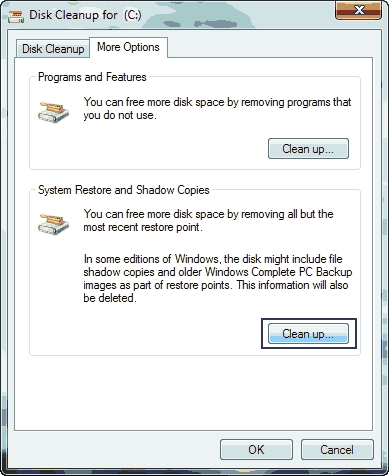 Now select Disk Cleanup under General tab. Now in the Window that pops up select all the options and click OK.
You can additionally delete System Restore points and Shadow Copies if you wish to, these are the backups that Windows take so that you can any time go back in time and all your files will be restored. This is found in the More Options tab. Deleting these restore points is completely safe since the most recent backup will not be deleted. Fragmentation is the process of splitting a file into many segments. This is done by the operating system when there is not much space available in continuous memory locations. So the OS splits the file and stores it into different parts of the drive. But this increases the access time of the file because now the OS needs to look for different parts for the file in different locations. So defragmentation is a process by which all the parts of the file are rearranged and moved to a continuous memory location. Then traverse to All Programs > System Tools > Disk Defragmenter, or you can simply type Defragment in the search box in the Start Menu and then select Defragment and Optimise Drives. 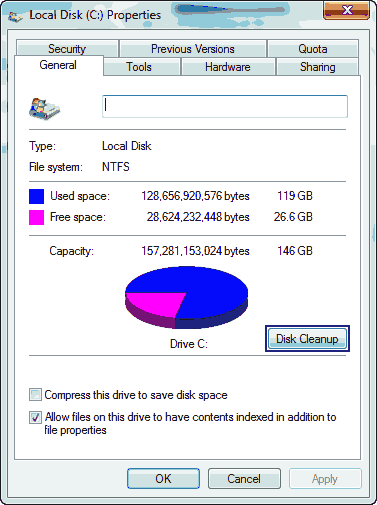 Now click on the drive you want to defragment and then click on Analyze disk. 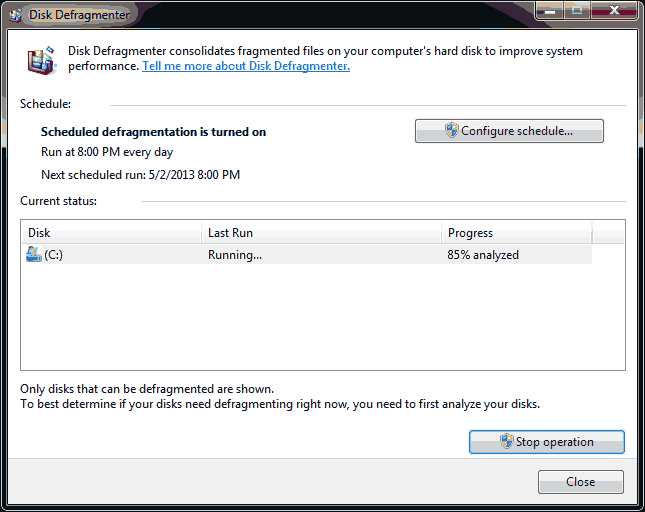 After this click on Defragment disk. NOTE I recommend you to schedule the defragmentation of the drives at least once in a week and specially for the Windows installation drive. Like startup programs there are many services that load at startup. They consume RAM and slow down the PC. But the good thing is, you have the authority to disable them too. 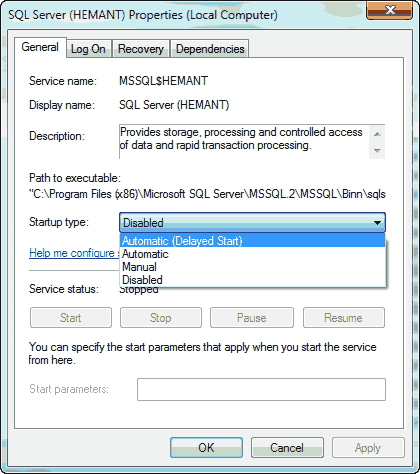 Open Start Menu and type services.msc and hit Enter. Now in the Services window you will see hundreds of services listed. Just read the description of each service and see if it needs to be run automatically at every boot or you want to start it whenever required. You have four options to choose from for each service. This can be done by right clicking on any service ans selecting Properties. You can disable a service. You can make it run automatically. You can make it run manually. You can make it to run Automatically but delayed, which means it will run after your Operating System and the programs are finished booting. Install only the essential software on your machine. The more software you install, the more is the memory consumption and hence less is the speed. Moreover, the software also consume hard disk space. You should also uninstall unused software from time to time. Make it a habit of checking the installed software every month and uninstall those you have stopped using. Click on Start Menu and type Add or Remove Programs. 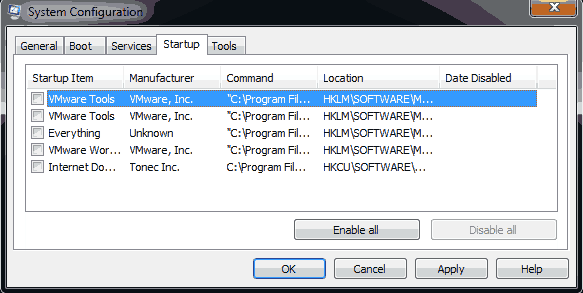 Select Add or Remove programs and here you can uninstall any program that you don’t use. Remember When you install any trial software and if after the trial you don’t feel like buying it, then do uninstall these softwares and don’t let them to eat up your resources. 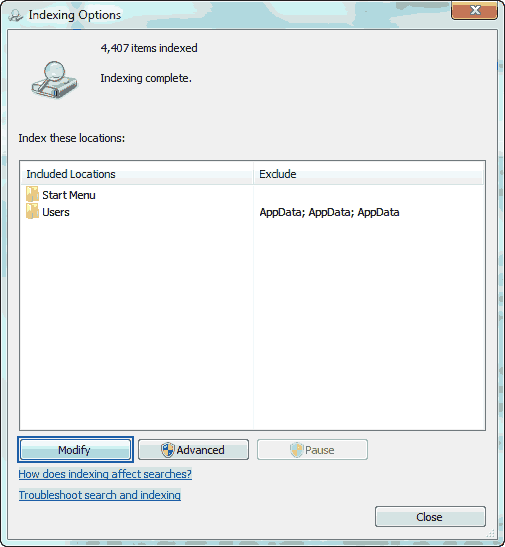 Windows 7’s Search is great but it takes high amount of resources. When your computer is running, it continuously works in the background and indexes your files to give you instant results. So, if you do not use Windows search or use it on rare occasions then you should either disable it or optimize it by limiting the locations which are indexed by Windows search. 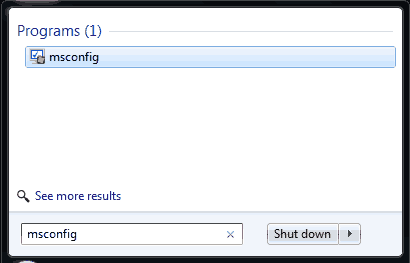 Open Start Menu and type Indexing Options. Now in the Indexing Options window, click on modify and choose the locations as per your requirements. 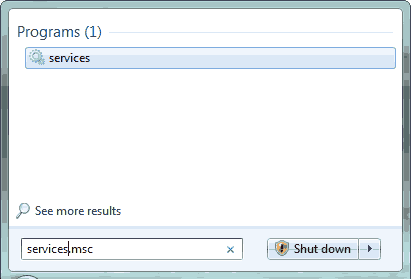 TIP Use Windows Search only for “Start Menu” and “User Files” like in the screenshot above. For other files, use a software like Everything instead of Windows default search. It gives faster search results and indexes in just a couple of seconds. ReadyBoost allows you to use a USB stick as a Cache memory, it’s as simple as that. The USB devices needs to have a minimum capacity of 256 MB and a 64 KBs of free space. Attach any USB disk to your system. 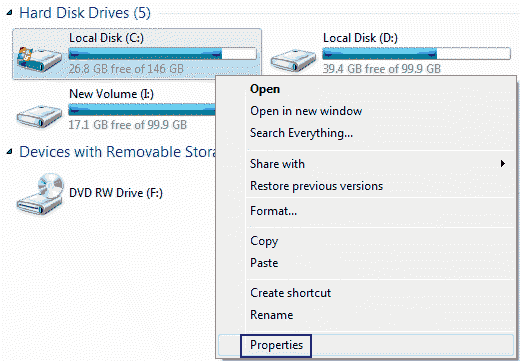 Open Computer, right click on the USB drive and select Properties. 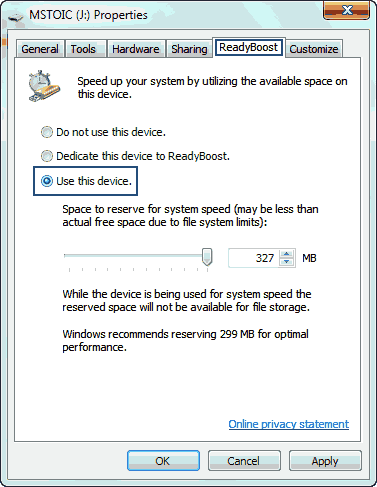 Now go to the ReadyBoost tab and select Dedicate the device to ReadyBoost to give all the available free space to ReadyBoost or manually select the size by selecting Use this device. NOTE ReadyBoost is not available for Solid State Drives. 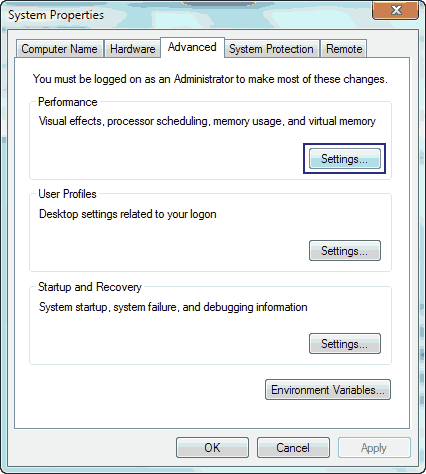 Windows 7 can be set to save power or to deliver High Performance. When set for High Performance the battery consumption is high but you will get an improved system performance. NOTE The increase in performance depends on the type of task you are performing and will not be equal every time. 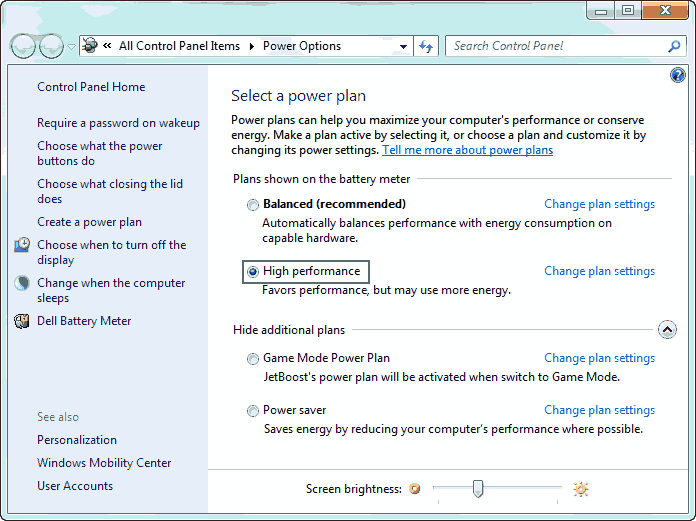 Open Start Menu and type Power Plan. Select Choose a Power Plan from the search results. In the Window that opens select High Performance. TIP Use Power Saver or Balanced plan when on batteries and “High Performance” plan when using the system on AC power. Viruses and Spywares are bad for the system and hamper security and reliability. These also slow down the system by issuing random requests, moving files and what not. If you are running any version of Windows then you must have a good antivirus installed. I use Microsoft Security Essentials, the best and the free solution from Microsoft. I have used it since it came to the market and it has been successful in keeping all the malwares and viruses off my system. 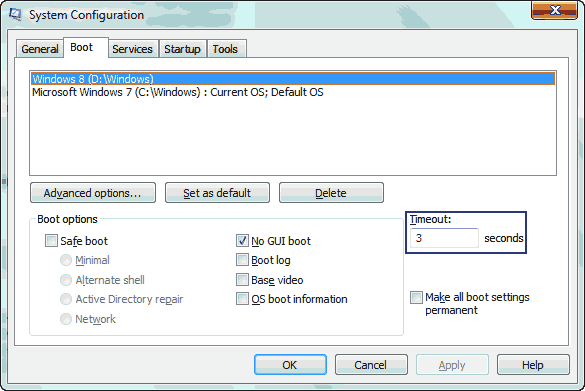 Boot timeout is the amount of time for which the OS shows the options to select the OS when you have multiple active operating systems installed, or the time for which it shows the menu for startup repair, or any other menu while booting up the computer. This is by default set to 30 seconds on Windows XP, Windows Vista, Windows 7 and Windows 8. But this is a lot of time user will ever take to make a choice. Decrease it to whatever the least value you want. In my case I have Windows 7 and Windows 8 installed and I have set the Boot Timeout to 3 seconds. Open Start Menu and type msconfig and press Enter. Now go to the Boot tab and under Boot Options, change the value of Timeout to a value between 3 to 20 seconds. NOTE This may seem to have no or very less impact on the system performance, but in cases where you have multiple operating systems installed, then the performance is largely improved and it saves a lot of time. Windows while booting up shows a nice animated logo. It is visibly very attractive but also take huge resources. To speed up Windows 7 you must disable this animation. In the System Configuration window that opens, go to the Boot tab. Now, tick the No GUI Boot option under Boot Options Menu. WARNING After enabling NO GUI BOOT you won’t see the Windows’s animated logo and instead will see a black screen. Don’t think that your Windows has gone corrupt or the computer has hanged, instead it’s still fully functional and is booting faster. If you follow all the above steps wisely than your boot time will greatly decrease. All the steps are safe to follow. If you are still not satisfies and want to improve system performance even more than you can consider upgrading your system or by simply getting a Solid State Drive (SSD), if it’s supported by your machine. I have seen great increase in performance by replacing the normal drives with SSDs.